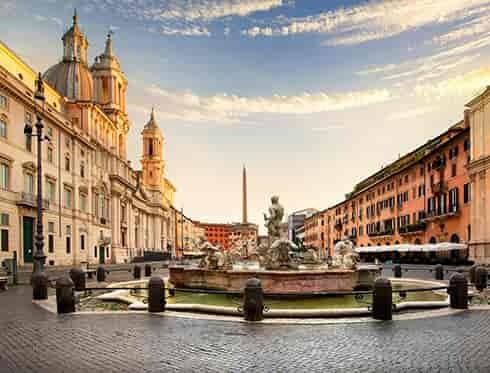 The delightful Piazza Navona is one of the places which best illustrates the spirit of Rome, combining the adaptation of a classical building (the Roman circus) to the urban structures of succeeding centuries. 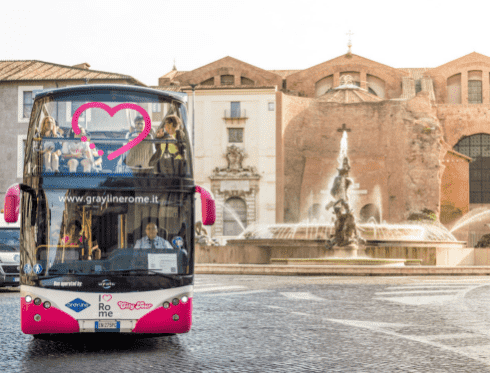 The triumph of Bernini’s Baroque style with his splendid Fountain of the Four Rivers combined with the relaxed festive atmosphere typical of the Romans, who come here to enjoy the scene. 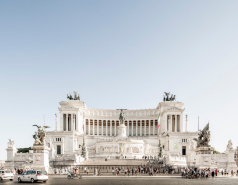 Lined with cafés and restaurants, and often thronged with tourists, street artists and pigeons, it is as picturesque – and as vibrant, day and night – as any piazza in Italy. 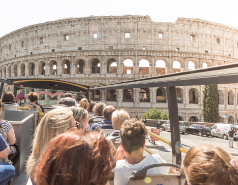 It takes its shape from the I AD Stadium of Domitian, the principal venue of the athletic events and later chariot races that took place in the Campus Martius. Until the mid-XV century the ruins of the arena were still here, overgrown and disused, but the square was given a facelift in the mid-XVII century by Pope Innocent X, who built most of the grandiose palaces that surround it and commissioned Borromini to design the facade of the church of St. Agnese in Agone on the piazza’s western side. The church, typically squeezed into the tightest of spaces by Borromini, is opposite the Bernini’s Fontana dei Quattro Fiumi, one of three that punctuate the square, and it’s said that all the figures are shielding their eyes in horror from Borromini’s church facade (Bernini was disdainful of the less successful Borromini, and their rivalry is well documented), but the fountain had actually been completed before the facade was begun. The grand complexity of rock, which represents the four great rivers of the world, is topped with an Egyptian obelisk, brought here by Pope Innocent X from the Circus of Maxentius. A few steps out of the piazza is Palazzo Altemps, with the beautifully displayed Ludovisi collection, and the lovely church of Santa Maria della Pace.